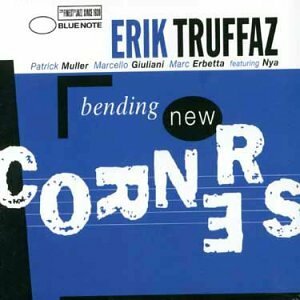 Does French jazzman Erik Truffaz qualify as a songwriter? To be honest, I’m not sure. Perhaps more a composer. But I like his stuff so much I couldn’t resist sticking it here as well. This interview was originally published by The Bulletin, Belgium’s newsweekly in English in February 2002. When does a trend become a bona-fide genre? The question is worth asking in jazz, as elements of groove and electronic music have been creeping into a number of musicians’ styles for the past five years or so. Things came to a commercial head with St. Germain’s breakthrough “Tourist” album, but well before that musicians had been bending jazz – somewhat against her will – towards a modern ear. Frenchman Erik Truffaz is in many ways a dream musician. As a trumpeter, he plays in a soulful, open-ended style that is steeped in the history and mythology of jazz. But unlike many contemporaries, the windows of his jazz are wide open. When he set his pure, melancholic licks against a hip-hop/groove backdrop on “The Dawn”?, he created a milestone recording. It was followed by the equally impressive “Bending New Corners” and a string of concerts, including shows at the Botanique and Cirque Royale. With “Mantis” (Blue Note, distributed by EMI), he has stepped back a little towards a more classic form of jazz. His quartet of Manu Codjia (guitar), Michel Benita (double bass) and Philippe Garcia (drums) plays with an easygoing respect for the masters. As Truffaz plays a cool trumpet, comparisons with Miles Davis are frequent – and not necessarily unfavourable. Apart from stylistic considerations, Truffaz and Davis are both musicians playing for their respective ages. Davis incorporated rock (and later funk) into jazz, Truffaz uses the colours of drum’n bass and hip-hop. Hello…I Googled for arabic pop music, but found your page about Erik Truffaz…and have to say thanks. nice read. Hi I was browsing Internet searching for miles davis musician and your blog regarding Erik Truffaz came my way. Very interesting! You really do know your thing! I\’m gonna bookmark you and come back in a few to see your new posting! Looking forward to! Cheers!